The barbette hit on the SOUTH DAKOTA by the 14" shell from Kirishima was almost at right angles and with a small downward angle. The shell tore a rather large hole in the 1.5"-thick STS (armor-grade steel) weather deck and dented the 17.3" Thick-Chill (55% (circa 9") hard face thickness!!) curved Class "A" barbette side plate!!! No "AA" round such as the wooden-nosed and very-thin-cased Type 3 incendiary/shrapnel shell or even a nose-fuzed Type 0 HE shell could do that - the former could not even penetrate a US heavy cruiser barbette, USS SAN FRANCISCO in this case, while the latter would blow up instantly and make no more than a scratch on the surface as it disintegrated sideways and, while its fragments could punch many small holes in the 1.5" deck under it, they definitely could not tear it open (the torn, bent-down deck plate had NO small holes in it when seen from underneath in a photograph taken from the deck below, so this damage was not caused by small pieces of an exploded Type 0 HE shell). The only shell left is a 14" (36cm) Type 91 AP shell (1480-lb) with its very long delay (0.4-second) delay-action base fuze and circa 22 lb of sensitive TNA filler (about a third of the cavity was made of cushioning material to protect this filler on impact; the Japanese wanted the most powerful explosive that they could get and compromised on filler size to get it, for some bizarre reason I cannot fully comprehend). The shell hit at a very shallow downward angle, tore a half-moon out of a raised sheet-metal hatch casing in front of the barbette and then hit the deck a couple of feet in front of the barbette, tearing up the teak deck and slamming into the barbette just below the weather deck level, leaving a dent (with a small "dimple" in the center) in the barbette plate and generated a series of concentric hairline cracks in the barbette surrounding the impact point (these are also visible on that same below-deck-looking-up-into-the-weather-deck-hole photo). The impact with the deck at this high obliquity pushed the deck down and projectile nose up slightly and tore the deck free of its heavy under-deck supports just outside of the barbette (it was not touching the barbette since you cannot anchor anything to the face of a Class "A" plate) and knocked off the AP cap, which was pulverized between the projectile nose and the barbette on impact, but no longer protected the projectile nose properly. The nose shattered, preventing penetration, and the projectile stood on its head as it reflected off of the barbette in a downward (and slightly to the left) direction. It began to move downward slowly (compared to how fast it was going before) and its base rotated around and slammed into the barbette just below the lower edge of the turret (directly under the middle gun of the turret, which was aimed at the Japanese ship that fired the shell we are discussing). This WHAMMMM!!! up against the rigid barbette added to the dent and left a second scar on the barbette just below the turret ring. It also caused the sensitive TNA filler to detonate and this ripped up the wooden deck over a wide area around the impact site, but did virtually nothing to the STS weather deck itself (the blast was directed parallel to the deck radiating from the barbette, not into the deck). The nose of the shell had by this time torn open a rather wide mouth-shaped opening between the dented deck and the barbette face (like a huge crowbar) and large pieces of the now-broken-up projectile tore into the one-deck space between the main armor deck and the weather deck, making many large and small holes in vertical bulkheads over rather a large area between the decks, though the main armored deck under the hole was hardly scratched. Thus, the impact was a potential disaster to the SOUTH DAKOTA if the shell had hit slightly higher and had its AP cap intact when it hit the plate. It might actually have penetrated in this case - iffy, but barely possible - and would most definitely have jammed the turret permanently until the ship went back an overhaul facility and had the damaged plate replaced and the internal barbette parts fixed. The decapping by the deck impact thus prevented all but rather minimal damage to the ship (the hit turret was still functional, if somewhat slow to move in train). HE shells are light-cased shells and, when combined with instantaneous nose fuzes (the only one used in the Type 0 HE shell), will do very little to even thin armor plate: For example, a 16" 1900-lb Mark 13/14 instantaneous-nose-fuzed ("PDF") High Capacity (HC) US Navy WWII shell cannot penetrate 3" of homogeneous armor!!! It makes a big dent, but the shell destroys itself before its nose tip can move more than a few inches forward - against a 17.3" Class "A" plate the effects would hardly be noticeable (definitely no dimple in that circa 9" of rigid face layer!!!). The holes it makes in thin homogeneous plates to the sides (such as the STS deck plate mentioned above) are caused by many small pieces of the shell moving very fast at close range due to the large detonating filler and look like a leaf partially eaten by many small caterpillars (lots of small holes and crescent-shaped cut-outs in larger torn openings). Tearing open a rather thick STS plate over a wide area, as happened here, by a filler explosion alone without making such small holes too (at least directly under the impact point, if nowhere else) is not possible: An HE gun projectile simple does not have enough explosive in it - only circa 80-lb of TNA explosive in this case - to do such a thing when not confined (this was an open-air explosion) against such a relatively thick STS plate (a downward bulge and popping rivets/bolts, yes; tearing the plate itself like a sheet of paper and bending it down so that the bent edge was actually vertical over a length of about 10' centered on the impact point, no). 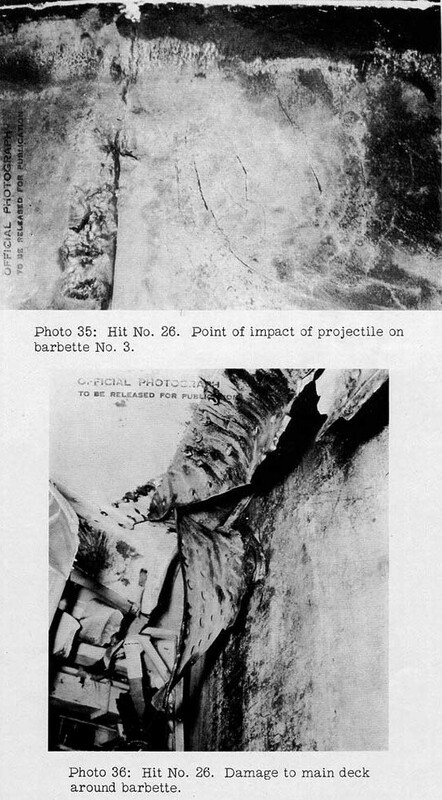 Also, the hit on that hatch casing or the deck would have almost certainly set off a nose fuze in an HE shell prior to reaching the barbette, so only some small projectile chunks would have reached the barbette directly, causing no damage whatsoever to the barbette internal fittings (a really solid hit by a big intact shell would be needed to dent that armor, as mentioned above). The external damage above the weather deck to the turret gun barrels and so forth would be roughly the same, but no large opening in the weather deck (some holes directly under the blast point and a big dent, probably), and much less damage in the space below the weather deck.